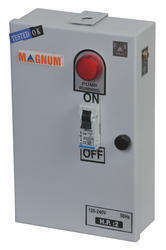 Magnum Single Phase Open Well Pump Panels are elegantly designed generally comprise of MCB and heavy duty run capacitor. Control Panels that help open well pumps to switch on and off, and also ensure the motor runs efficiently with their run capacitors. Magnum Open Well Pump Panels controls open well pumps which are used for domestic, industrial & public water supply schemes. Fitted with Miniature Circuit Breaker for reliable overload protection. Fitted Run Capacitor for given torque in running condition of motor/pump.